In 1968 I was working for Mid-north engineering a company owned by Lynda's uncle Arthur and her father Jack. I remember the day of her disappearance so well. The anguish it caused her family and friends. I often think of her, and wonder why her murder was not solved. She just seemed to disappear. The efforts put forth by her family to find her were tremendous, but to no avail. Just passing on my regards to her family. I'm glad that at least they found her even if it was 5 years later. It must have been hard on the family. It is suspected that a brother of one of Lyndas roommates may have been involved in her death. Hi, thanks for joining. Did you speak with police yet? I am sure they would love to hear what you had to say. Is this information from 1968 or did you learn of something recently? It would be great if you have something the police could use to solve this. :oNot good to leave your name and number on this site. The murderer could be out there and hunt you down. Anyone with any information that is able to solve these matters should definitely call crime stoppers or notify the police personally. If you do not want your name or number to be known you can always get in touch with CS because they don't want a name, they only want your information. Think of it as if it was your sister or brother or family member and do not hesitate to contact the authorities. It does not give particulars as to what she did after the exam. Who was with her or what her plans were. More information should be noted to the public and let the chips fall. It is time for the public to know more and maybe it could be solved. This is a long time for this to go on with no clues. Thanks, capeheart! Good info, and you can call from a phone booth, if you are scared. Summary: Lynda White, 19. Attractive, with long blonde hair (at least in the newspaper photos). Last seen: Nov 13 1968. Lynda had written a french exam at 6:30 at the University of Western Ontario in London. That was the last time she was seen. There was evidence that she went back to her apartment, at 34 Argyle St., and changed clothes. Found: May 9, 1973, 4 1/2 years later, near St. Williams, Norfolk County. Cause of death: ? Sexual assault -- possible. Other background: I saw mention of a rumour (strictly a rumour) of possible involvement by Lynda's roommate's brother. I'm new here. A friend and I were discussing the Linda White case as it has been of interest to me for many years and I decided to see if there was anything on the 'net about it and found this site. According to the police, my roomate and I might have been the last ones to see Linda. I was writing a French test with her at UWO and she finished before me - my roomate was waiting in the student centre to give me a ride home and as Linda left, I told her I'd be finished soon and to go up and wait with Jim and we'd give her a lift home. She went up, had a coffee with Jim and decided that she didn't want to wait - when last seen, she had thumbed a lift with (supposedly) a blue Volkswagen and was never seen again. I still haven't heard whether or not they ever found her. The thing is there was somebody in the London area at the time who had been in Goderich at the time of the Stephen Truscott affair and apparently had been interviewed about that case. I believe that he was a psychologist or something along that line. From what we heard, he moved to London around the time that women started to disappear. The officers that interviewed my roomate and I mentioned this person but we never heard anything more. I'd be very interested to hear if anything further ever happened with Linda's case - she was a good friend. No, Linda was a university student in 1st year at Western - I'm guessing 18 or 19 at the time. I knew her quite well as she had a locker next to mine - we were both non-resident students. A group of us also went to the Homecoming football game together - she disappeared shortly after that. 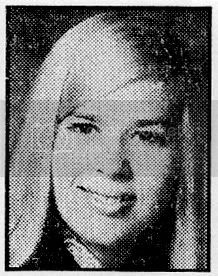 A few days after she went missing, I was talking to her roomate and according to her, Linda had returned to their apartment (on Wharncliffe Road about 1/2 mile from the campus) after her French test and changed clothes. This fact led the original investigators to suspect that she had just run away at the beginning of the investigation. The police came and interviewed my roomate and I at our apartment but that was it - I always wondered, did they ever find her? In conjunction with the above posts by 1950stoney, gibbons speculated about the old Saunby carding mill. Apparently it was abandoned (and spooky) back then. From my post up above you will see that Lynda's address was quoted in an old London Free Press article as being 34 Argyle St., which is off St. Patick, which is several blocks south of Saunby, and about one block south of Oxford, right near the river. Walking straight north on Argyle, it would appear that is would only be about 300m to 400m to Saunby from Lynda's place. I don't know if, back in the 1960s, there was access across the railway tracks to do that though. My first impression was that Lynda's case might be related to that of Jacqueline English, Priscilla Merle and Georgia Jackson, but subsequently there has been one niggling detail that has been bothering me. Specifically, it relates to the fact that her wallet was found in Burlington, her home town. How did it get there if she was abducted in London and her body was disposed of approximately half way between London and Burlington? GoNgo Thank you for bringing her to our attention, including the many details that you gave us. Hopefully someone on this site, may be able to add more information. Or someone who comes across this site, may be able to give more clues. Keep in touch. This is SO interesting...and helpful. Thank you so much for providing the local context of the time. I wasn't sure what the 'layout' was around Oxford/Argyle back at that time. Regarding the location of this thread...I certainly expected to find it on the London forum as well. After all, that is where Lynda went missing from. I'm not sure if we can have it moved over. I like your thought about why her wallet may have been found in Burlington. That piece just didn't make sense to me unless the killer was from her home town. Thanks again for your insight Gibbons. I know it's a long shot, but what about any relationship to the Scott Leishman murder? Yes, the others are females, but it appears that Scott was likely dumped in Big Otter Creek and he disappeared in time between Georgia Jackson and Lynda White. the male/female victim difference lowers the probability as does the fact that his clothes weren't scattered hither and yon. But the locale, the timing and the age are similar. I believe I've seen two other images of Lynda, which I'll try to uncover.